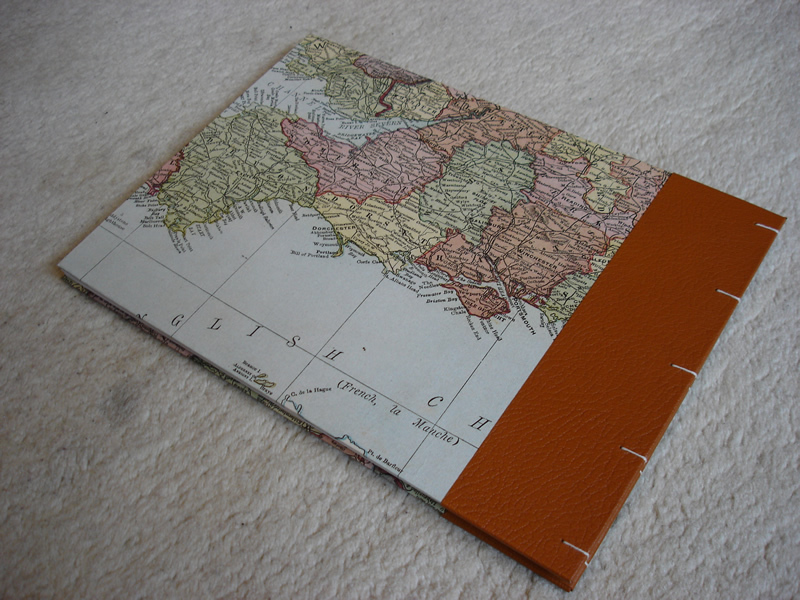 No, not an actual disaster, but a commission inspired by the Paper Plane range by Disaster Designs. 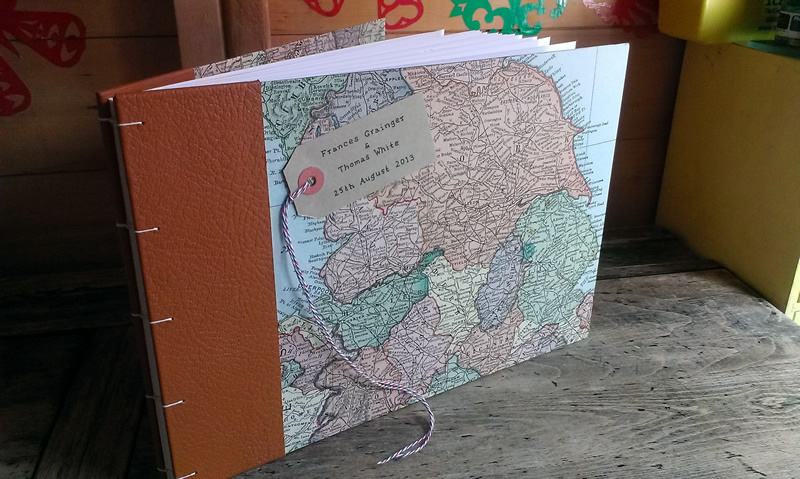 Back in January I was contacted by a friend who wanted a guestbook made for her wedding. 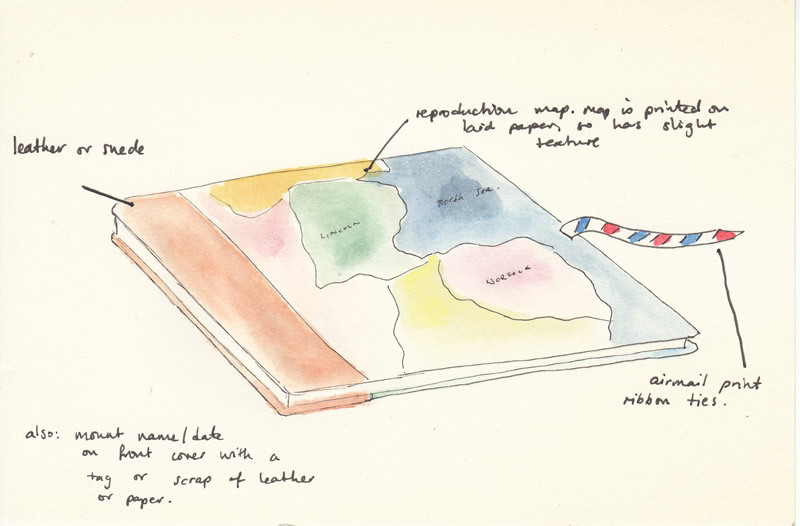 I’d like something A4 and landscape with coptic binding, as suggested, and we’re expecting 120 guests. We’ve not really got a theme for our wedding, it’s a bit of a mishmash! Our invites are vintagey luggage tags and I love the Disaster Designs paper plane range with the old airmail border, old maps, that sort of thing. My bridesmaid will be wearing teal/turquoise but we’re not going nuts with a specific colour theme. I don’t imagine that’s very helpful really! She also included links to some of the Disaster Designs items she particularly liked. Despite her fears, this was all incredibly helpful! I had a think, and played around with a few ideas. 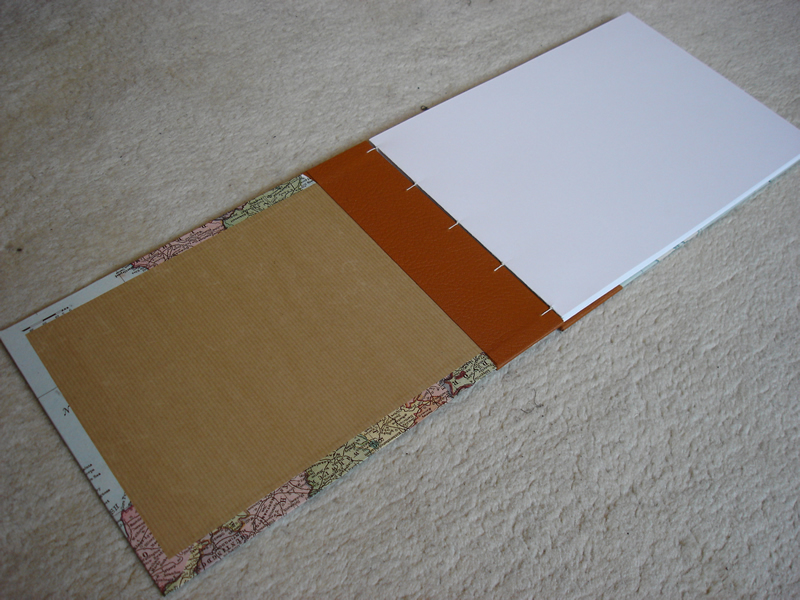 My first thought was to have sturdy fabric pages covered with pockets so that guests could write their message on a luggage tag and then slot it into the book – this idea didn’t really get past the rough stage, but it’s certainly something I might attempt at a later date! In the end we settled on the design you can see pictured above. 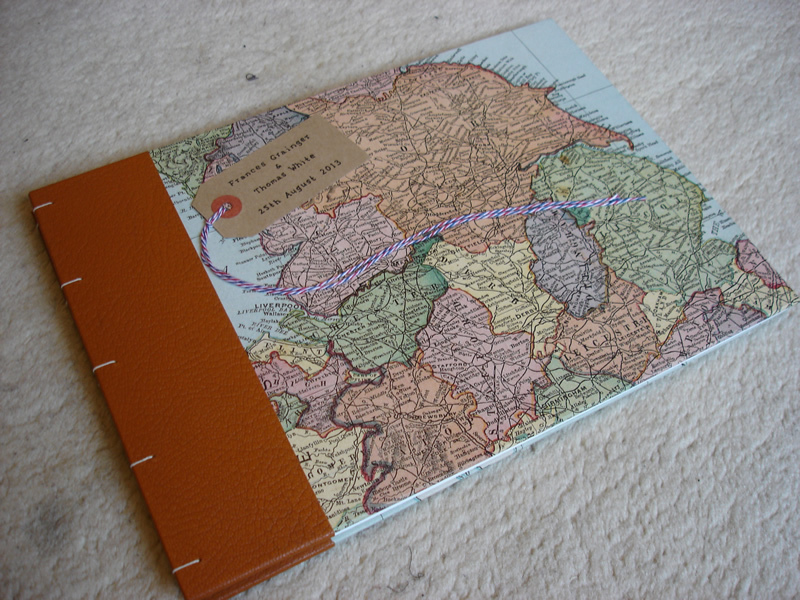 I used a map print by Cavallini & Co for the covers: it would have been nice to use a map which was more personal to the bride and groom, but they were born at opposite ends of the country so it wasn’t that practical! 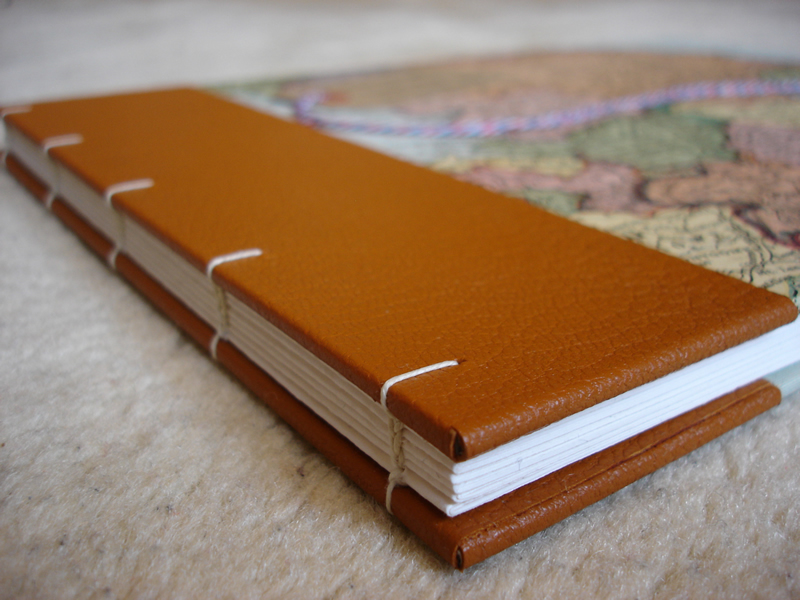 I chose a lovely tan leather to create the look of a quarter-bound binding, and attached a luggage tag to the front bearing the names of the couple and the date. The idea of using some airmail bias tape as a tie closure was abandoned as, in the end, I thought it made the design look too cluttered. I did use some airmail style bakers twine on the luggage tag though, which I thought was a more subtle nod to the Paper Plane range. I loved working on this commission as, like the bride, I am a huge fan of the Disaster Designs stuff. I can’t believe it’s taken me this long to get round to blogging about it (the wedding was in August! ), but it’s here at last and I hope you all enjoy seeing it.